Last week was good for the British pound, and the cable is still near the few-month highs as we are heading into week 4 of January. It looks like the market has finally abandoned all concerns with the Brexit negotiations, allowing the politicians to put an end to the issue without any trouble. Meanwhile, Theresa May said there will be no additional Brexit referendum. Indeed, the talks about second referendum are groundless, although this topic is being very much discussed. Still, the referendum that was held in June 2016 is well enough for making a strategic decision. The third reading regarding Brexit took place in the House of Commons on Jan 17 and was successful. Thus, the law is passed, and so the UK will leave the EU on March 29, 2019, which means there's a little more than a year for conducting the whole process, arriving to agreements, and designing the documents. This is very little time considering how hard such negotiations between the British and EU politicians usually are. The pound's reaction towards fundamentals is mostly neutral in January. More reactions come from London fixing, the USD falling or recovery, and the general interest of the market towards buying. An exception when the pound did react to the fundamentals were the retail sales data released on Friday. Core retail sales fell by 1.5% MoM in December, while it rose by 1% in November. YoY growth is at 1.4%, with it being 1.5% last month and the expectations at 2.6%. Technically, GBP/USD is heading towards the important level of 1.4000. 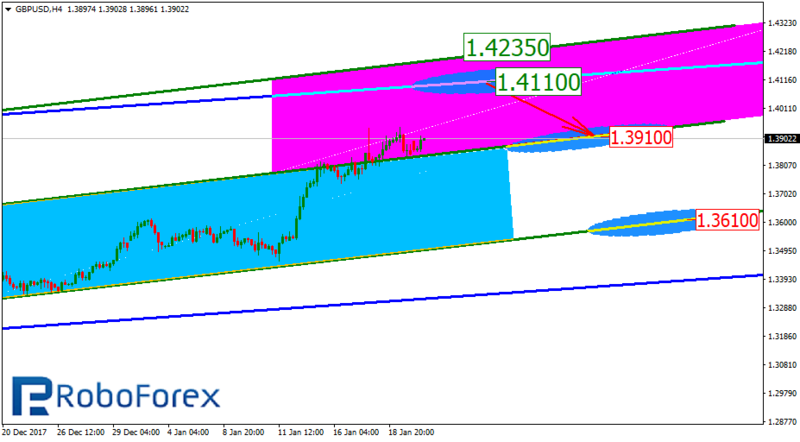 Both mid term and long term trends are stable, and currently the mid term trend aims to reach the long term channel resistance at 1.4110. This could potentially lead to the price reaching 1.4235, which, with the mid-term channel resistance broken out, is quite probable. However, the price is now testing the resistance that became support, and, most likely, the pound is going to rise to 1.4110 and then retrace to 1.3910. If it happens so, the next important level for the downtrend will be 1.3610.